We’re just hours away from witnessing the biggest scrap in UFC history when champion Brock Lesnar looks to unify the heavyweight crown against interim champ Shane Carwin at UFC 116. Lesnar is the largest specimen to ever dawn Octagon gold, however Carwin isn’t too far behind. Both check-in at over 6 feet 3 inches tall and are among the few elite heavyweights in the world that require a weight cut in order to hit the 265 pound limit. Although they matchup fairly well physically, that’s where the similarities end between the two title holders. 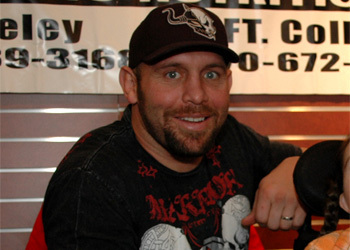 Carwin is humble and soft-spoken, while Lesnar completely smears the fine line between confident and downright cocky – despite being granted a new lease on life following his career-threatening bout with diverticulitis. While Lesnar has been-there-done-that in regards to starring in blockbuster pay-per-views, he’s never done what the engineer did early Saturday morning. Just as he’s set to embark on the toughest test in his perfect 12-0 career, Carwin released this humble letter of gratitude directed towards his friends, family and fans. Whatever happens tonight this feels right and I know it is in Gods hands now. My coaches and training partners have given me everything they could for this camp. The sacrifices have been made, the time put in and now it is time to put it all together. This week has been a whirlwind I have found myself on TV shows I normally watch, endorsing products I usually drink, and being treated like a super star. The entire casino and strip is loaded with ads for UFC 116 it is amazing. The hotel room is larger then my first couple of homes and they even have poker tables with Borck and me on them. There is no doubt in my mind I a living the American Dream. My Mom always told us if we work hard and do our best to earn what we want we will be blessed with more than we would ever need. As I look at my life I know that is true. I have an amazing family and I am married to an wonderful woman who is helping me raise my son and our daughter. My Mom, brothers and I are all enjoying the fruits of our labors. If you have a dream you need to be chasing it. You can make anything happen if you put in the effort and hard work. Tonight it is not about winning a belt or being ranked number one in the Heavy Weight Division. Tonight is about two super talented big guys who have put a life time of work into being the very best they can be. Tonight all the hard work and sacrifices comes down to 25 minutes of war. I am as ready as I have ever been. I feel ten years younger, I feel faster and stronger than I have ever been for a fight. I was maybe 80% healthy for 111 and usually I limp into the fights with some sort of injury. This is the best my shape my mind and body have been in on fight day. I am honored that Lesnar would give me the chance. It takes a real man to face the very best after a long lay off. Brock doesn’t seem to take any short cuts and I expect to see the very best Brock Lesnar ever tonight. He is a tough fight for anyone and holds the one thing that all of us fighters int he division are hunting for, the UFC strap. Whatever happens tonight the winner will be faced with one of the most stacked Heavyweight Divisions ever and absolute beast like Cain, Dos Santos, etc are working hard or waiting for their shot. It is an exciting time to be a part of the UFC heavyweight Division. I want to thank my Coaches, training partners, manager, and sponsors for everything you do for me. None of this would be possible without your support. Max Muscle, Good4uDrinks.com, Dethrone, Bud Light, The Gun Store, Malibu Boats, Giant Release, Magnum Detox, GunsAmerica.com, PerformanceMMA, HeadBlade, Warrior Int, MTX Audio, Night Rider Jewelry, BlowoutCards.com.